For too many years now, my culinary colleagues and I have lamented the lack of upscale Greek cuisine in Salt Lake City. Sure, there are dozens of perfectly good places to find a great gyro or souvlaki. But when it comes to fine dining, Aristo's has, for as long as I can recall, been pretty much the only Greek game in town. That has always struck me as odd, given Utah's vibrant Greek community. I'm happy to report that one such Greek eatery has recently opened. The newly opened restaurant is Manoli's, named for owner/chef Manoli Katsanevas. Trained in culinary arts at Salt Lake Community College, Katsanevas boasts kitchen experience ranging from working in his parents' Crown Burgers restaurant to stints at Fresco, Caffe Niche, Fleming's and Grand America's Garden Café. Following the success of his catering business, chef Katsanevas now has a restaurant to call his own, and it's been a hit from the day its doors opened. When Matt Caputo of Caputo's Market & Deli raves about a restaurant, I listen. He doesn't pull punches and, like his father, Tony, he is very discriminating when it comes to food—especially Italian and Greek food. So, while I normally don't like to visit restaurants during their first few weeks of business—Manoli's has been open only about a month—I was eager to find out what all the fuss was about. If you're anticipating the predictable Greek blue-and-white color scheme with splashes of gold and bouzouki music playing in the background, think again. Manoli's is an ultramodern space, bright and bustling. White plastic chairs and benches with blond-colored wood tables complement the lemon and tan hues of the walls. One entire side of the restaurant is an open kitchen, where diners can enjoy watching Greek magic being made. A small bar in the rear of Manoli's is the perfect spot for a cocktail and meze, classic Greek small plates. A word to the wise, however: If noisy restaurants bother you, avoid Manoli's during rush hours, which seem to be all the time. There's nary a soft surface in the place, and sound bounces freely around the restaurant, seemingly amplified. On the positive side, it's that buzz that helps makes for a lively, energetic eatery. Before I tell you what's on the menu at Manoli's, let me tell you what's not: gyros and souvlaki. As I mentioned, there are plenty of other places in Salt Lake City to get your Greek fast-food fix. Here, you'll find meze and entrees that have a contemporary, "fresh and local" uplift. For example, the yemista meze is a trio of bright-red roasted and peeled piquillo peppers, stuffed with smoked feta, sprinkled with chopped scallions, drizzled lightly with quality olive oil and kissed with black sea salt ($8). There's simply nothing to interfere with the naturally delicious flavors of the peppers and feta. Vegetarian, seafood and meat meze options are available. 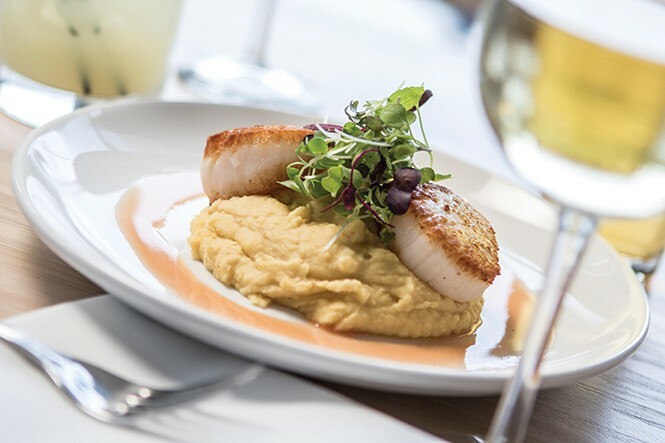 Another outstanding meze choice is called htenia ($12), two large sea scallops, seared perfectly (still translucent in the center) and served on a luscious purée of yellow split peas, garnished with microgreens and a ring of citrus-ouzo vinaigrette. What an unexpected use of ouzo! Perhaps as a nod to the Greek gyro, chef Katsanevas offers up arni psito: lamb-belly sliders with smoked feta-cheese spread, Greek coffee barbecue sauce (barbecue is one of the chef's specialties) and pickled cucumber, served on artisan buns ($12). Other enticing meze options—and there are many—include charred octopus with warm Zürsun (Idaho heirloom beans) salad called htapodi; pork and beef meatballs (keftethes) with cinnamon-spiked tomato sauce and Kefalograveria cheese; and crisp chicken wings with lemon, oregano and olive oil called kotopoulaki. The only meze that we didn't really love was krytharaki, a generous portion—more than enough for two to share—of al dente orzo with gooey Parmesan and white-cheddar cheeses, caramelized onions and breadcrumbs ($8). I felt the krytharaki would be better served as a side dish rather than a standalone meze. Manoli's has a full bar, and offers some interesting signature cocktails such as the Greco-Mexican War (reposado Tequila, lemon, cinnamon and Grand Marnier foam) and the Moscow Moulári, a playful twist on the Moscow Mule, made here with vodka, fresh ginger, lime, ouzo and soda. Manoli's offers a small but adequate selection of locally brewed beers and 15 or so wines, most offered by the glass or bottle. Naturally, Greek wines, including Agioritikio and Moschofilero, find their place on the wine list along with other excellent choices like Soter Pinot Noir, Emmolo Sauvignon Blanc, Latour Grande Ardeche, Caymus Conundrum and Masi Campofiorin from Italy. You could easily make a meal of meze. However, that would mean that you'd miss out on wonderful entrees like moist and juicy Mary's half-chicken, roasted and served with lemon rice pilaf, grilled toast and an exceptional chamomile broth ($25). I honestly don't know how this dish could be improved upon (perhaps with the addition of shaved truffles?). And, I'll say the same for Manoli's grilled branzino ($30), impressive enough to garner oohs and aahs from adjacent tables. It was two large, beautifully grilled branzino fillets with braised fresh greens, roasted purple and yellow fingerling potatoes and ladolemono, a Greek lemon-and-olive sauce. Add excellent, friendly service to the roster of fine Greek fare, and it becomes clear what all the buzz is about. I can't even imagine what the crowds will be like when Manoli's starts serving lunch and brunch. Grab a table while you still can.